When this post is published, I will be enroute to Woodstock, Georgia to meet up with Team W. You might be wondering if that is some sort of sports team. It’s not. Team W is the collaboration of three authors: Lauren Willig, Beatriz Williams, and Karen White. Two years ago, Team W debuted their first joint effort: The Forgotten Room. This multigenerational story is told in three time periods by three different women. Each author took one of the points of view, and none of them revealed which character they wrote. What’s rather amazing about the whole feat is that I read through the novel- in a single sitting, no less- without experiencing any loss of continuity. I confess to being surprised by this. Three different people wrote three different characters and the book read like it had been penned by a single person. That’s spectacular. There are two reasons I’m driving pell-mell down though the Tennessee mountains to be at this event. First, I so enjoy meeting up with Team W. They are three charming, intelligent, and genuine women who I admire. Plus, Beatriz loves opera and that just makes me happy on a host of levels. The second reason I’m going is for you, dear readers. For the month of September, I am giving away a brand new AUTOGRAPHED copy of The Glass Ocean. Remember, this is not a novel written by one, but by three authors, and all of them will sign your copy if you are the lucky winner. So, here is what you need to do to throw your hat in the ring. You must be a subscriber* to Whiskers On Kittens. (*At this time, I can only offer this giveaway in the United States, the United Kingdom, and Australia. I am working on making future giveaways available to my subscribers worldwide, but it’s a slow process of learning all the legal parameters.) If you are already a qualifying subscriber to Whiskers, then move on to step two. If you haven’t subscribed yet, and reside within the US, UK, or Australian, then scroll to the bottom of this post and fill out the form. In the comments section below, tell us why you’re excited for a chance to win this book. Is it because you love stories that span generations? Or do you like mysteries- plots that are interwoven through decades of secrets? Are you a fan of one or all of the authors? Do you just love books and jump at any chance to win a free one? Let us know what caught your attention. And that’s it. Relatively simple, I’d say. I wish I could write more about this book from a personal experience, but alas, I have yet to read it. (I’ll be getting my own copy today, too.) However, I am absolutely certain that it will be spectacular. Just take a gander at this plot. So, what do you think Sarah found in the box? Those clues all point to that fateful voyage of the Lusitania in April of 1915 when two women from different walks in life, with different desires, and each possessing big problems in their life, board the Lusitania for London and the hope of a new future. There’s the Southern belle, Caroline Telfair Hofstetter and her industrial tycoon of a husband, Gilbert. Caroline is hoping that this trip will rekindle the romance in her marriage as Gilbert seems to be drifting further from her (ha, no pun intended). Is it his work that’s driving a wedge between them? Caroline hopes that’s it, but she has that wifely intuition that says there’s more than meets the eye. Settled in a first class suite on the opulent Lusitania, she’s all set to get to the bottom of her husband’s behavior. All set, that is, until she bumps into the man that got away: Robert Langford. Love on the high seas, I suppose, but will it be Gilbert or Robbie? Any takers on that one? Then there’s Tessa Fairweather, a middle class woman returning to her home in Devon, traveling second class. Except she’s not Tessa, she’s Tennessee, and she’s never been to England. She’s never even left the States. What she most certainly is is a Schaff; good ole Father Schaff passed his con man ways onto his daughter. Tennessee can forge any document and concoct any cover story. She’s been doing it her whole life. And she’s sick of it. This trip on the Lusitania is her swan song. If her partner’s to be believed, once they’ve pull off this last heist on the Lusi, they’re gonna get out of the game for good. But Tennessee’s uneasy about something. Is it that she doesn’t trust her partner? Or is she a clairvoyant, sensing the imminent doom of one of the most beautiful vessels to sail the high seas? How about that for a plot? There’s a lot of intrigue. It also seems like there’s a little something for everyone here. Mystery. Romance. Suspicions. Thievery. This book spans generations and countries and cultures. It promises to be a very fun read, don’t you think so? I’m breaking one of my rules here, dear readers. Being married to a man who makes his home aboard ships for more than half the year, I ordinarily shy away from storylines that deal with ships sinking. (Titanic is a no-no. Along with the Poseidon Adventure.) I don’t like to think of people being lost at sea because their ship sunk. I’m sure you understand. But, The Glass Ocean is by Team W, so it has to be good. It just has to be. This giveaway (promotion) is open to current as well as new subscribers. To subscribe, scroll to the bottom of the post and fill out the form. When you click subscribe, you will be sent an email requesting that you verify your email address. Once you do so, you will receive a Welcome email in your inbox. Please add Whiskers On Kittens to your address book so that you can be kept abreast of all the latest- be it posts or upcoming giveaways- here at Whiskers. Whiskers On Kittens uses Disqus as her comments' moderator (to minimize spam for you all, dear readers). It is very simple to sign in. If you have a Google, Facebook, or Twitter account, you can log in via those sources. Or, if you’re like me, you can create a Disqus account, which gives you access to their app. The giveaway (promotion) will be open from 12 A.M. September 4th, 2018 until September 27, 2018 at 11:59 P.M. Central Time. The winner will be notified by email and announced on September 28th here at Whiskers On Kittens as well as on Facebook, Instagram, and Twitter (links to follow all are at the bottom of the page). I wish I could christen this giveaway with a magnum of champagne, but, alas, sailing the cyberseas doesn’t allow for such antics. But, I will say good luck as this giveaway gets underway. 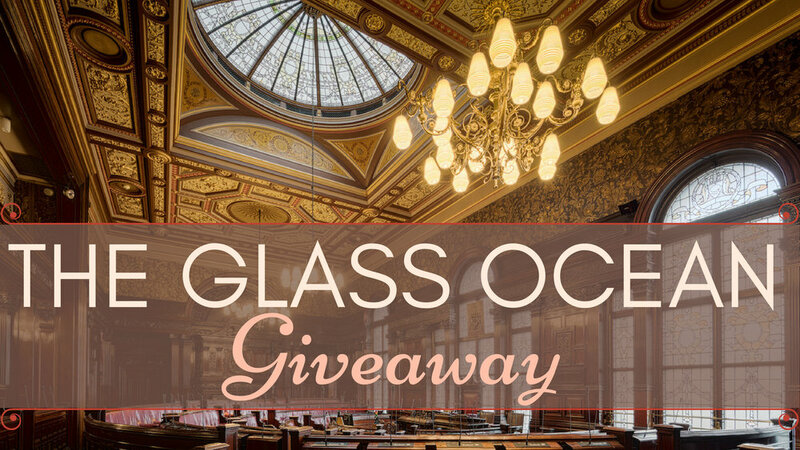 Sign up for a chance to win one of my favorite things: an autographed hardback copy of The Glass Ocean by Karen White, Lauren Willig, and Beatriz Williams. (Don't forget to leave a comment to ensure your complete entry.) Giveaway open to all U.S., U.K., and Australian residents. Winner will be selected at random. Winner will be verified. Winner will be notified by email and will have 48 hours to respond. If no response is received in that time limit, a new winner will be chosen. Void where prohibited. How About Some Fun Short Stories?